For the past 3 weeks, I've been motivated by a desire to declutter. It started with the smallest girls' room, which was a disaster zone. So I went through and pulled out a TON of clothes and toys. Then I decided to paint the twins' room. That led to more decluttering of girls' clothes and toys. Once I got started, I didn't want to stop. I worked on my clothes. I found clothes in my closet that were 3 sizes smaller than what I currently wear! I worked on games and puzzles in the living room. I worked on books in the school room. I worked on kitchen cabinets. I can't tell you how much better I feel with less clutter in the house. I'm nowhere near finished decluttering the entire house, but the progress I've made already makes me feel less stressed. To finish off all my decluttering, I had a yard sale. The best advice I can give about yard sales is DON'T have one. It was a lot of work for the small amount of money we made. Our sale was scheduled to start at 7am, and one lady showed up at 5:45 as we were putting items out. She had the audacity to complain that things weren't labeled to make it easier for her to find stuff. Umm, hello! I'm trying to get stuff out of my house into the yard first. I've discovered that wanting less stress in my life is a great motivator. Clutter brings me stress, so decluttering was necessary. My next project is to get all of the lesson plans for the year put into the computer to make this school year less stressful. 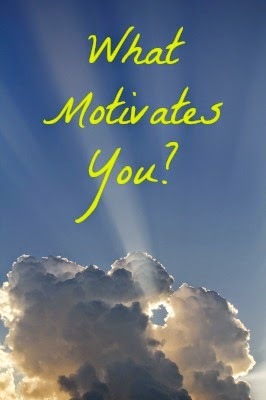 What motivates you? Why do you do the things you do every day?